The L82 we can live without and the H82 is limited in scope. The D82 is a winner, though, with its time-proven processing. H82 good for low-end additions. Excellent clarity and weight from D82. Can give extreme effects, if necessary. L82 has audible side effects. No gain reduction meters on the L82. Slightly crunchy treble with H82. Can be dangerous in the wrong hands! Sonic Sweet is a collection of three plug-ins designed to make your mixes clearer and louder, and it follows in the 'enhancer' tradition of BBE's famous Sonic Maximiser hardware range, including an emulation of their mysterious processing. All three plug-ins are designed to be used as channel inserts. The Sonic Maximizer was BBE's flagship device back in the '80s. "We're not sure what it's doing… but we like it!" was a common reaction. It wasn't as excessive as the alternative, the Aphex Aural Exciter, which could make things overly fizzy. 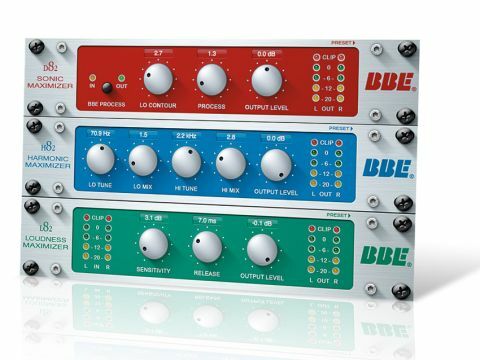 BBE's box brought a clarity to the top end and fatness to the bottom, and today there are a range of hardware Sonic Maximizers to choose from. The company have long maintained that the devices "correct" phase shift and distortion, while sceptics claim that the process is in fact much less esoteric. But whatever they do, the Sonic Maximizer D82 plug-in emulates it. You get three controls: Lo Contour, which enhances unspecified bass frequencies; Process, for doing the same to the treble; and an Output knob. Simple but effective. Essentially, it works like a fancy tone control or a variable 'loudness' button, but there's no doubting that it does something pleasing to both individual sounds and whole mixes. There's a danger of overdoing it and losing all your mid-range content, though - the controls go up to ten, but you'll probably live to regret straying anywhere above four! In our audio example below, the Lo Contour was at 2.7 and the Process at 1.3 and that's already quite extreme. The Harmonic Maximizer H82 is perhaps BBE's more direct answer to the Aphex Aural Exciter, although there's no BBE hardware equivalent. It's a bass enhancer, synthesising bass harmonics, and a high-frequency exciter. The idea is you tune it in and add harmonics to the desired range. Even more so than the D82, this is dangerous in the wrong hands and easily overdone. It's ideal for livening up poor recordings but is often too much for other uses. Like the H82, the Loudness Maximizer L82 has no hardware counterpart. It's a multiband limiter with fixed bands and two controls: Sensitivity (ie, threshold) and Release, plus an output level. There's no gain reduction meter to let you know how hard you're pushing it and, despite it being multiband, we experienced a fair degree of pumping from the kick drum at a low push. Multiband dynamics units are only really broadly useful when you can adjust the bands and know what you're doing. Exciters have been around since the '70s and were all over the place by the '80s, when every new record had to be brighter than the last one to the point where some of the releases were almost unlistenable due to the ear-searing presence and treble. Just remember how kick drums sometimes ended up as little 'blips'! Whereas a high-frequency EQ boost simply turns up harmonics that are there to begin with, exciters generate sympathetic orders of harmonics that aren't already present. As a result, they can sound edgy and unnatural, even with small amounts of excitement. But of course, highly unnatural sounds are very much a part of music production, so exciters can certainly work their magic in a mix. Focusing on the very high end of the frequency range to add 'air' is usually the most successful route, while generating extra bass harmonics can add perceived weight and thump. Overall, there are better alternative individual plug-ins out there. The H82 isn't something you'll use on every mix and the L82 is a bit of a lemon. The D82, however, is great for adding thump and sparkle - if you get the pack mainly for this one, you shouldn't be disappointed. Just tread carefully with the 'enhancements' and remember to compare to commercial mixes while you're at it, so you don't overdo it.